Many people are familiar with turmeric’s bright yellow aspect that gives so many spice blends or garam masala their yellow tinge. Turmeric is often used in in curry powder to give curries their taste and appetizing color. Turmeric comes from the curcumin plant, and is a powder made from the root of the plant rhizome Curcuma longa, which grows and is harvested primarily in the Middle East and Asia, and is an integral part of the diet from these parts of the world. While it was initially common in the countries where the plant grows and where it is native to the Indigenous populations of the Middle East and Asia, and in particular in India, turmeric is now available in many places around the world and is widely exported and can be purchased in powder, root, tincture and supplement form (both as capsules as well as in tablet form). The scientific name for turmeric or Curcumin is Curcuma longa. The turmeric powder is usually extracted from the root of the plant, which is a bright yellow, and which gives its color to the powder. 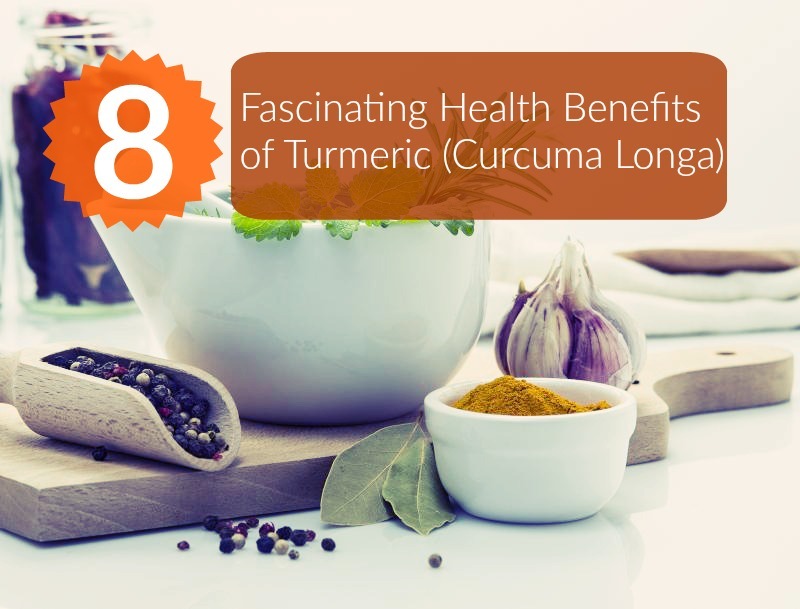 The Curcuma longa plant is related to the ginger family of plants (Zingiberaceae), and much like ginger it grows in similar conditions and has a great many health benefits to offer for either acute use or even for daily use as part of the everyday diet. The active ingredient extracted from the plant is curcumin, and this is what gives turmeric its many health benefits. While turmeric has its own appeals in cuisine and other uses, it shares many health benefits with other foods rich in anti-oxidants and has a number of benefits that are unique to turmeric itself. There is overall very little risk in using turmeric, which is outweighed by the many benefits it has to offer. Turmeric contains many vitamins and nutrients that help with the many health benefits that it has to offer. In terms of vitamins, turmeric contains folates, niacin, as well as vitamins A, E, C, and K.
It also contains electrolyte balancing substances such as sodium and potassium, and many minerals, including calcium, copper, magnesium, iron, manganese, phosphorous and zinc. It contains no cholesterol and is primarily carbohydrate and dietary fiber when administered in either powder form or as a root. The contents can vary somewhat depending on the soil in which it was grown, how it is harvested and extracted, as well as how it is processed and transformed into its powdered form. It is also possible to obtain turmeric and curcumin in other forms, such as tinctures, where the root or powder from the root is mixed with alcohol and turned into a liquid extract of the substance for more potent and readily available medicinal use. Curcumin can also be available as a supplement, in which case the concentration of the substance is more potent and available specifically for medicinal use rather than for flavor or cuisine. 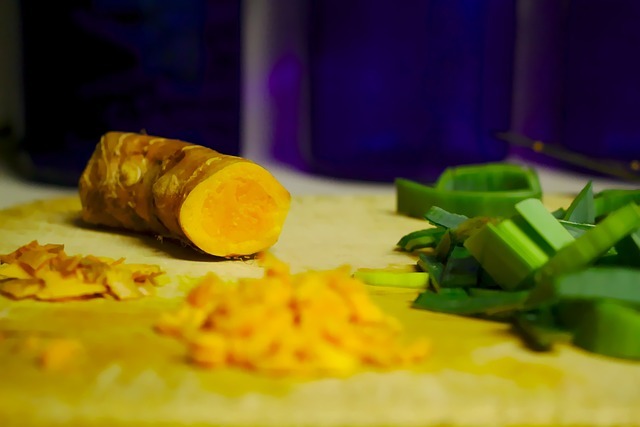 This is the most powerful way to consume turmeric, as compared to simply using it with food. Turmeric has been used for many different purposes throughout history, ranging from culinary uses for its color, flavor and texture, to a plethora of medicinal uses in folk medicine as well as more recently studied in scientific medical research for its medicinal benefits. Because of the bright yellow color that turmeric is known for, it has also been widely used as a dye for fabric, especially before synthetic dyes were developed, and is still used today as a day by artisans or in places in the world where synthetic dyes are simply not available. Aside from fabric dyes, turmeric has also been used on its own or in combination with other compounds, as a way to dye milk, yogurt, cheeses, salad dressings, margarine and other foods to make them more appealing due to the appetizing bright yellow that comes from the turmeric. Turmeric has also been widely used in a ceremony (Gaye holud, Bengali wedding) and there are many myths associated with turmeric is various countries around the world where the plant is native. It has played an important role in Hindu spirituality especially for a variety of different celebrations and rituals involving the plant. Turmeric is extracted by boiling the sticks from the root, then drying them. Once the roots are dry, they are crushed into a powder form, which takes on the very recognizable yellow tone of the root itself. Turmeric is used extensively in cuisine for its flavor and appealing strong golden yellow color. 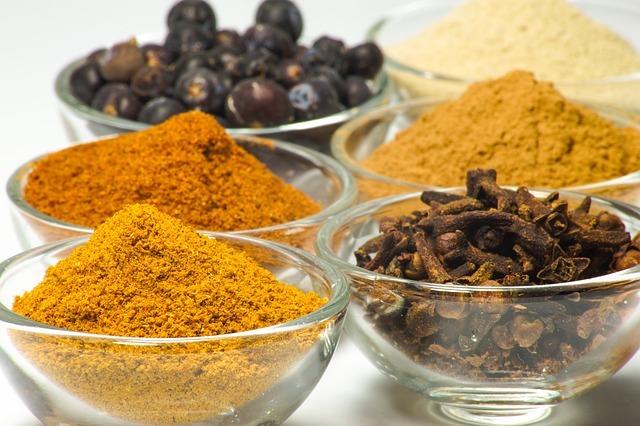 It has a very distinctive and potent flavor that blends well with many other spices into blends of spices known as Garam masala, which is the base for many curry dishes. Throughout the Middle East and Asia, turmeric is a hallmark of many dishes and is a staple food that offers both a delicious and appealing visual aspect to the dishes, as well as many health benefits that come along with its regular consumption. What About The Leaves of The Turmeric Plant? The turmeric plant, Curcuma longa, is widely used and harvested for its roots. However, the leaves of the plant can also be used for a number of things. They are edible and safe to use, and while they are not as potent as the root and there are few studies that examine the health benefits of the leaves, they are known to be associated with some health benefits. They are considered astringent, antiseptic and have been used in folk medicine in cases of jaundice as well as for reducing fevers, particularly fevers related to malaria. Some also use it as a wash for sores and ulcers. The fresh leaves can be used for pastes, in cuisine such as dishes where the leaves are used to wrap fish and provide flavor, and they can also be used in tempering or whole, to spice up any dish. The fresh leaves must be stored properly to be kept away from mold and bacteria, preferably in a cool, dry place or a refrigerator, and consumed within a week from harvest to get the best flavor and avoid any deterioration in active ingredients as well as ensure they are still safe to eat. The leaves can also be dried, which gives them a longer life span than fresh leaves. The leaves can be dried in the sun or dried commercially using machines, or a home oven as can be done with other foods to dehydrate and dry them without cooking them. While the plants are very common to its native Asia, and is particularly readily available all over India, where the plant grows naturally in the wild, and is also available in backyard gardens and window ledges, it is more difficult to find the plant elsewhere and get access to the leaves. The leaves are also not as frequently exported and can be hard to access outside of India or Asia. Turmeric has been used as a medicinal plant for many centuries in India and Asia especially. As well as being a part of the regular diet, it has been used to cure many ailments and as a part of caring for oral health. However, beyond this, it has many health benefits that have been explored and demonstrated by contemporary scientific research as well as being promoted by holistic health practitioners and nutritionists. The anti-inflammatory properties of turmeric have been proven in various studies. It has been demonstrated to be more helpful in cases of acute inflammation than in cases of chronic inflammation, though it can still assist with chronic inflammation when integrated into a regular diet. Studies show that turmeric can have some benefits for oral as well as systemic health in humans. Because of its anti-inflammatory effects, turmeric has been shown to help with pain and swelling when applied directly to painful areas of the mouth and has been demonstrated to have positive effects for those suffering from dental troubles such as gingivitis and other periodontal diseases. It is thought that turmeric’s anti-inflammatory properties are at work in this case. Turmeric has also been proven (study) to have positive effects in patients suffering from mood disorders, depression and other forms of mental illness. Because it releases certain properties that affect brain function, several studies have suggested that the substances contained in turmeric can have positive effects on mental health when consumed regularly in sufficient quantities. As with many other foods that promote cancer prevention, turmeric is on the list of items that contain antioxidants (proved by this study) which are excellent for healing damage from free radicals in the body. Turmeric is excellent for promoting the health of cell tissue and healing the damage caused by free radicals, which are known to have improved health outcomes for cancer patients as well as prevent cancer. Turmeric is also excellent for protecting the health of the liver (study) and blood stream. As many other foods that contain antioxidants, turmeric helps the body cleanse itself of toxins and dangerous free radicals. Turmeric has also been shown to improve cardiovascular health, especially in post-menopausal women (study) and in particular when combined with a regular exercise routine. Its anti-inflammatory effects, as well as the anti-oxidants in turmeric, play a role in this, however, it also seems to have an effect on blood flow and blood pressure, which improve cardiovascular health overall and reduce the risk of heart disease. Turmeric has also been demonstrated to reduce the risk of cancer, among other things because of the anti-oxidants it contains and its ability to nourish the tissues at the cellular level and repair damage from free radicals. In particular, the active ingredient of curcumin within turmeric is what is required to get the most benefits. Turmeric is also the subject of studies that suggest it could have properties that are beneficial to promote the health of brain cells and tissues and prevent Alzheimer’s disease. While further studies are required in this area, current research does seem to point towards its preventative effects and may be one of the most promising avenues of research to seek treatment and cure for Alzheimer’s disease. While there are no specific side effects related to turmeric and no documented cases of over-dose in conjunction with turmeric or curcumin, there have been some concerns raised with regards to lead poisoning. While this is rare and there is little or no documentation to support the concerns that this could be a widespread problem, some concerns have been raised about lead poisoning due to some of the compounds contained in turmeric, which can be problematic if it is not used or processed safely. This would be a more important concern in the case of supplements, where the contents are more potent and the effects are amplified. While there is a debate about whether or not the amounts of available curcumin in turmeric or curry powder is sufficient to have all the health benefits that turmeric can offer, it remains that regular consumption of this food substance would still have some benefit. Certainly, use of organic turmeric would mean greater availability of the compounds that promote health benefits than any foods that might contain more pesticides or have genetically modified organisms at their source. 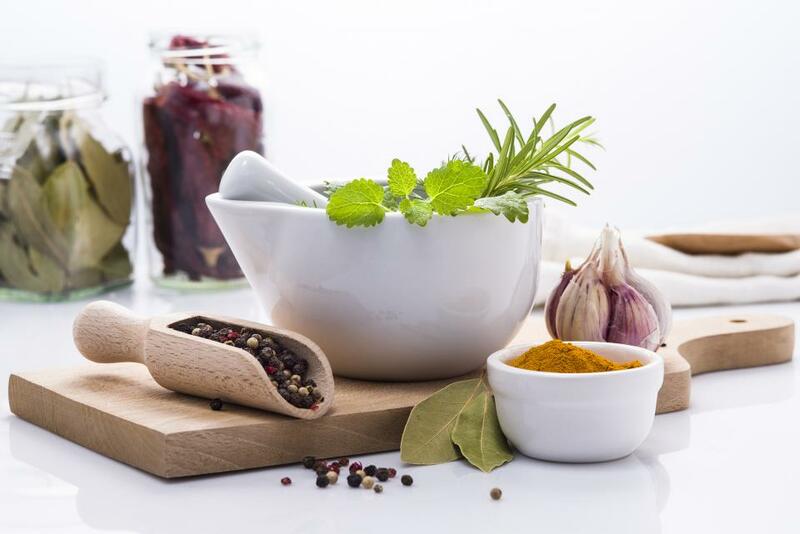 However, this being said, to obtain the best outcomes of using turmeric, supplements will offer the most potent results in terms of the medicinal properties available in curcumin. Turmeric is among the most potent and healthiest active ingredients to add to your diet and is considered a superfood for this reason. It has benefits for so many conditions that adding it to your diet can benefit overall systemic health, immune health, and the appearance of the skin, in addition to being delicious, and having the appealing look of its golden tinge.